Yea yea yea...another basi(stale) post. Anyway, examination was finally over on Friday. 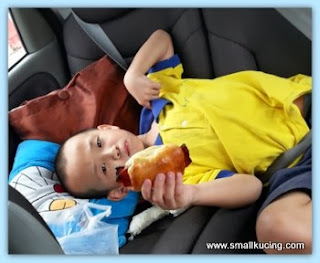 I got a surprised when Papa and Mamarazzi came to pick me up from the Kiddy. We were not going home. Instead we are heading over to Ah Mah's house! Yipeee!!! Took a very long time to arrive. Not many cars on the road but it was mostly cloudy and rained some. Ah mah's not cooking that evening. We went to Restaurant Ocean for dinner. Adoi...it was under renovation. No more seaside liao. Land reclamation. How looking out the window, I can only see roads. Slight fever so I had young coconut to "cool" down my body. 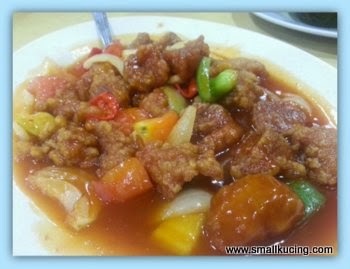 Had the sweet sour pork for dinner. Nice. 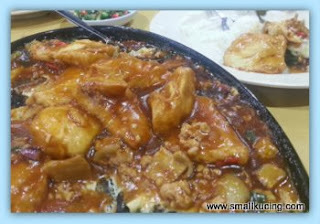 Sizzling Tofu....that night it was not up to the usual standard. 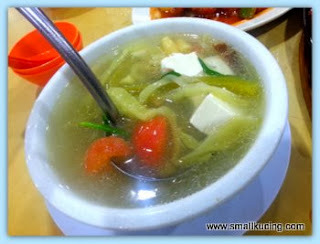 But for me I mostly drank the salted vegetable with Tofu soup. Me tired? No way... still full of energy. When arrived Ah Mah's house, she was surprised that I was still in my uniform . Stinky me! How is Small Kucing feeling now? Salted vege soup looks very appetizing!! Food looks good! Eeeee...no veg kah? That was just tofu soup with a bit of salted veg added. Nice roadtrip immediately after school. 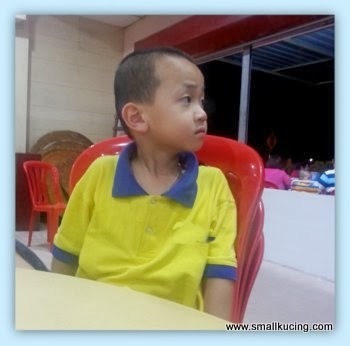 No wonder Small Kucing is not tired but very excited. that's nice. Small Kucing is a big boy already! Exams over, time to relax. Glad that you are feeling better. I know how the crowd can be during weekends in Chinese restaurants. So either earlier or eat something else. Quite like dishes. Am sure you did very well in your exam too!! wah, nice dishes!! i think Ah Ma lazy to cook and also want to try those nice dishes lah.. Uncle SK love all three dishes, the sweet and sour pork and the toufu so good to go with rice, and the salted veggie soup so cooling and appetising also!! errr, tarak order green veggie meh?? All the dishes are my favourite. I always love to order sweet and sour pork and sizzling tofu. My top choices! Clever boy! 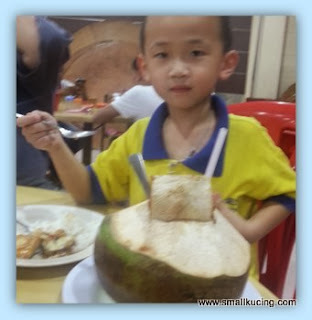 Drink coconut juice is very healthy and cures wonders!! 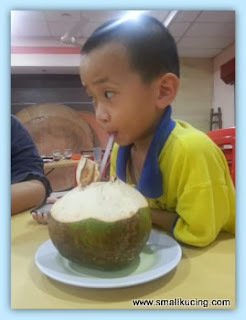 Anay suffers from gum aches often and barley or Chinese herbal tea cannot help at all until I googled that coconut juice can heal. It really worked and even healed migraines and prevent my occasional Vertigo! Your Mamarazzi is one smart cookie, she knows drinking coconut water will help put the electrlytes back into your system. Just what you need when running a fever.